One of the most fascinating aspects Peter Brown’s biography of Augustine is his portrait of Augustine’s intellectual development. Like many other dominant figures in church history, Augustine was marked by a dramatic conversion experience. But though the moment of conversion in 386 was acute and decisive, the larger process surrounding this moment was more complex, involving a back-and-forth interplay between Christianity and various other non-Christian or sub-Christian religions and philosophies. More so than other dominant figures in church history, it seems to me, Augustine is marked by this complicated intellectual development—his struggle towards a distinctly Christian faith amidst competing alternative religions and philosophies on the market. He reminds me a bit of C.S. Lewis in this way (and in other ways). I think this aspect of Augustine’s life provides a helpful window into how Christianity and other religions and philosophies relate, for in Augustine you this struggle working itself out in both a great mind and a great heart. 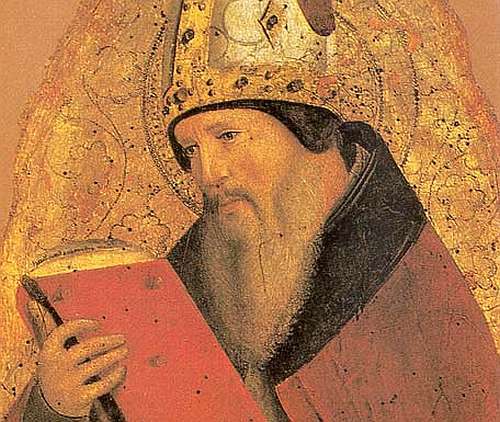 Several features of Augustine’s intellectual development are worth drawing out. First of all, he was a Manichee for almost ten years before his conversion to catholic Christianity. That’s a long time, long enough to leave a permanent stamp on his expressions of thought, and indeed Brown argues that one can detect the lingering presence of certain features of Manichaeism in Augustine’s writing (such as its dualist frames of thought) even long after his vehement rejection of Manichaeism. But more significantly, it was not orthodox, catholic Christianity per se that led him out of Manichaeism, but a sort of loose conversion to neo-Platonism, which exposed to his mind the errors of the Manichaean view of good and evil. Standing before Augustine’s conversion to Christianity in 386 is a more basic vocational conversion from a literary career in rhetoric to philosophy and the pursuit of truth. Some historians have merged Platonism and Christianity together as one distinct movement in Augustine’s development, but Brown demonstrates that Platonism was an autonomous (brief) phase just before his conversion (cf., e.g., 140). While it is an error to view this as the “real” conversion, as some of the revisionist scholarship puts forward in the attempt to muffle the significance of the 386 conversion, it is equally an error to regard this more basic conversion as possessing no significance at all, just as it would be foolish to regard C.S. Lewis’ conversion to theism in 1929 as possessing no significance for his conversion to Christianity in 1931. Augustine’s absorption with Plotinus in the 380’s was as a kind of preparatory stage, an intellectual incubating period, making him ripe for that crucial moment in the garden in 386. Neo-Platonism was a necessary bridge for Augustine along the pathway from Manichaeism to Christianity. All of this brings up not only the complexity with which God may bring about that moment of regeneration in a human soul, and the influence a non-Christian philosophy may have on a person’s journey to Christianity, but also the continued relation of Christianity and other religions after one’s conversion. For neo-Platonism was not decisively discarded by Augustine when he embraced Christianity, but continued to develop in his thought alongside Christianity, interwoven with it. Only gradually over the next decade does neo-Platonism recede into the background as Augustine drifts away from an intellectualized Christianity, from the Platonic ideal of the “Philosopher” pursuing wisdom, and becomes, by the time of The Confessions in 397, more more distinctively and more simply, Christian. Moreover, more clearly than with Manichaeism, neo-Platonism leaves a lingering influence on his thought and expression, palpable for example in his admiring attitude towards pagan philosophy in The City of God (written between 413-426). One could perhaps say that his neo-Platonism gets absorbed into and transformed by his Christianity, rather than simply replaced by it. But even this is a process, and (again) takes a decade. The issue that arises in my mind is the effect that a non-Christian philosophy or religion can have in preparing someone for Christianity. Augustine himself testifies in Confessions that Cicero’s Hortensius turned his prayers towards God and awoke in him a love of truth. I think also of the point Tolkien pressed to Lewis about pagan myth in their famous late-night conversation with Hugo Dyson, which Lewis said was the human cause of his conversion. It seems to me that Christians, without softening at all on the uniqueness of Christian revelation, must nevertheless have a humble attitude toward the potentialities within non-Christian thought. For within the categories of common grace and general revelation, there is sufficient revelation for a good deal of apprehension of truth—ample soil in which God to do his “plowing” work. But to take the thought even further, Brown argues that this great struggle in Augustine had the effect of developing his later thought more concretely into Christian ways: “he had been a Manichee; he had come so close to an ‘autonomous’ Platonism that the experience lived on powerfully in him. He had not written Confessions for nothing. A middle-aged man’s sense of having once wandered, of regret at having found truth so late, will harden Augustine’s attitude” (277). Thus in his later writings, Augustine’s relation to alternative religions and philosophies takes on a different tone. This is evident from a consideration of the historical context of The City of God. It is popular to see it written directly in response to the sack of Rome in 410. Brown argues this is over-blown; the event gave Augustine a new audience by driving educated Romans down into Africa (especially Carthage, which Augustine frequented), but the real cause of the book was Augustine’s growing desire to confront a Pagan philosophy that had been developing and becoming popular in Numidia. Thus it was not merely Manicheism and Donatism against which we can see the development of Augustine’s thought throughout his career; it is also cultured Paganism, and then Pelagianism. But these later confrontations are marked, not as before with the slow emergence of a Christian core from a murky, confused stew of influences, but as a decisive and eloquent Christian critique from the outside, like the fall of a hammer or the pull of a saw. Augustine has passed through his development and become his own. He is no longer emerging from a shell, so to speak, but swooping down to pounce on insects.